With Get & Transform and Power Pivot in Excel, you'll spend less time manipulating data, and more time driving impact. Watch this 2-minute video to learn how. Whether it's small data sets or large ones with up to millions of rows, you can connect, clean, analyze, and share your data faster. This 10-minute learning guide will show you how. Virtual Labs – These hands-on labs go deeply into Get & Transform and Power Pivot within a virtual environment. edX.org Analytics Course – For the analytics enthusiast, we offer a free self-guided course on these capabilities, complete with videos, labs, and references. Excel Tech Community – Talk about analytics with the new Excel community. Plus, learn new tips and tricks, or share your experiences with data analysis. General Excel Support – Visit the main Excel support page for more information on analytics or other topics. Where can I find Get & Transform and Power Pivot? With Office 365 ProPlus, the Excel app on Windows for PCs offers the full Get & Transform and Power Pivot features that further enhance your analytics and modeling capabilities, take advantage of advanced data connectivity options, and effectively share your data across the organization. See the details below for more information on Get & Transform and Power Pivot availability and ask your IT team if your current Office plan supports these features. Advanced analytics features are available with Office 365 ProPlus, Office 2016 Professional, Office 2016 Professional Plus, and Excel 2016 standalone one-time purchases. In addition to the basic analytics features, you can use Get & Transform to import, shape, and merge data from corporate, big data, and cloud data sources, conduct corporate data catalog search, and share queries. Advanced data model support with Power Pivot includes a dedicated data modeling editor, a data view, DAX calculated columns, KPIs, and hierarchies. * Learn more about the 64-bit versus 32-bit version of Office to maximize performance. Are there data analysis features on Excel 2016 for Mac? Yes, Excel 2016 for Mac has many of the same basic analysis features that are listed above: PivotTables, slicers, charts, and basic import capabilities. It does not yet have Get & Transform or Power Pivot, but we are continually improving Excel on the Mac. Get & Transform provides fast, easy data gathering and shaping capabilities. Get & Transform enables you to connect, combine, and refine data sources to meet your analysis needs. Learn more about Get & Transform. Power Pivot allows you to perform powerful data analysis and create sophisticated data models. With Power Pivot, you can mash up large volumes of data from various sources, perform information analysis rapidly, and share insights easily. You can use the Data Model and a collection of tables to create relationships stored as part of the workbook. The Data Model integrates deeply with other features in Excel, such as tables and Pivot Tables, to provide a seamless analytics experience. Learn more about data analysis and modeling with Power Pivot. Power BI is a suite of business analytics tools that deliver insights throughout your organization. With Power BI Desktop, you can connect to hundreds of data sources, simplify data prep, and drive ad hoc analysis. You can also produce reports and then publish them for your organization to consume on the web and across mobile devices. Everyone can create personalized dashboards with a 360-degree view of their business. Governance and security tools are built-in. Learn more about Power BI. How do Excel and Power BI work together? Excel 2016 and Power BI Desktop deliver a portfolio of tools that is unique in the industry. Together, they enable business analysts to more easily gather, shape, analyze, and visually explore their data. Power BI is a suite of business analytics tools that deliver insights throughout your organization. It helps anyone in your organization bring together data from a wide range of sources—Excel workbooks, on-premises corporate data, Azure services, and other popular cloud-based offerings like Salesforce.com or Marketo—to view and share using live dashboards and interactive reports. 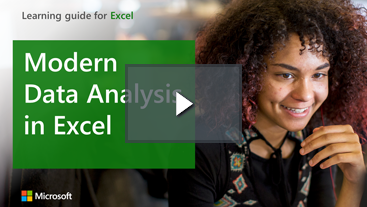 Learn more about how Power BI and Excel work together. For Office 365 subscribers, Excel 2016 has added enhancements to the functionality and features you're already used to.